Gasoline (American English) or petrol (British English) is a transparent petroleum-derived liquid that is used primarily as a fuel in spark-ignited internal combustion engines. It consists mostly of organic compounds obtained by the fractional distillation of petroleum, enhanced with a variety of additives. On average, a 42-U.S.-gallon (160-liter) barrel of crude oil yields about 19 U.S. gallons (72 liters) of gasoline after processing in an oil refinery, though this varies based on the crude oil assay. The characteristic of a particular gasoline blend to resist igniting too early (which causes knocking and reduces efficiency in reciprocating engines) is measured by its octane rating. Gasoline is produced in several grades of octane rating. Tetraethyllead and other lead compounds are no longer used in most areas to increase octane rating. Other chemicals are frequently added to gasoline to improve chemical stability and performance characteristics, control corrosiveness and provide fuel system cleaning. Gasoline may contain oxygen-containing chemicals such as ethanol, MTBE or ETBE to improve combustion. Gasoline used in internal combustion engines has a significant effect on the environment, both in local effects (e.g., smog) and in global effects (e.g., effect on the climate). Gasoline can also enter the environment uncombusted, both as liquid and as vapor, from leakage and handling during production, transport and delivery (e.g., from storage tanks, from spills, etc.). As an example of efforts to control such leakage, many (underground) storage tanks are required to have extensive measures in place to detect and prevent such leaks. Gasoline contains benzene and other known carcinogens. The use of the word gasoline instead of petrol outside North America can often be confusing. Shortening gasoline to gas, which happens often, causes confusion with various forms of gaseous products also used as automotive fuel (for example, compressed natural gas (CNG), liquefied natural gas (LNG) and liquefied petroleum gas (LPG)). In many countries, gasoline has a colloquial name derived from that of the chemical benzene (e.g., German Benzin, Czech benzín, Dutch benzine, Italian benzina, Russian бензин benzin, Polish benzyna, Chilean Spanish bencina, Thai เบนซิน bensin, Greek βενζίνη venzini, Romanian benzină, Hebrew בנזין benzin, Swedish bensin, Arabic بنزين binzīn, and Catalan benzina). Argentina, Uruguay and Paraguay use the colloquial name nafta derived from that of the chemical naphtha. Gradually, volatility gained favor over the Baumé test, though both would continue to be used in combination to specify a gasoline. As late as June 1917, Standard Oil (the largest refiner of crude oil in the United States at the time) stated that the most important property of a gasoline was its volatility. It is estimated that the rating equivalent of these straight-run gasolines varied from 40 to 60 octane and that the "High-Test" (sometimes referred to as "fighting grade") probably averaged 50 to 65 octane. By 1935, there were seven different aviation grades based on octane rating, two Army grades, four Navy grades and three commercial grades. By 1937 and the introduction of 100 octane gasoline, the confusion increased to 14 different grades, in addition to 11 others in foreign countries. With some companies required to stock 14 grades of aviation fuel, none of which could be interchanged, the effect on the refiners was negative. The refining industry could not concentrate on large capacity conversion processes for so many different grades and a solution had to be found. By 1941, principally through the efforts of the Cooperative Fuel Research Committee, the number of grades for aviation fuels was reduced to three: 73, 91 and 100 octane. Oil and its byproducts, especially high-octane aviation gasoline, would prove to be a driving concern for how Germany and Japan conducted the war. As a result of the lessons of World War I, Germany had stockpiled oil and gasoline for its blitzkrieg offensive and had annexed Austria, adding 18,000 barrels per day of oil production, but this was not sufficient to sustain the planned conquest of Europe. Because captured supplies and oil fields would be necessary to fuel the campaign, the German high command created a special squad of oil-field experts drawn from the ranks of domestic oil industries. They were sent in to put out oil-field fires and get production going again as soon as possible. But capturing oil fields remained an obstacle throughout the war. During the Invasion of Poland, German estimates of gasoline consumption turned out to be vastly underestimated. Heinz Guderian and his Panzer divisions consumed nearly 1,000 U.S. gallons (3,800 L) of gasoline per mile on the drive to Vienna. When they were engaged in combat across open country, gasoline consumption almost doubled. On the second day of battle, a unit of the XIX Corps was forced to halt when it ran out of gasoline. One of the major objectives of the Polish invasion was their oil fields but the Soviets invaded and captured 70 percent of the Polish production before the Germans could reach it. Through the German-Soviet Commercial Agreement (1940), Stalin agreed in vague terms to supply Germany with additional oil equal to that produced by now Soviet-occupied Polish oil fields at Drohobych and Boryslav in exchange for hard coal and steel tubing. Japan, like Germany, had almost no domestic oil supply and by the late 1930s produced only 7% of its own oil while importing the rest - 80% from the United States. As Japanese aggression grew in China ( USS Panay incident ) leading to increased tensions between the U.S. and Japan, the U.S. began placing restrictions on exports. In July, 1940 the U.S. issued a proclamation that banned the export of 87 octane or higher aviation gasoline to Japan. straight-run gasoline, commonly referred to as naphtha, which is distilled directly from crude oil. Once the leading source of fuel, its low octane rating required lead additives. It is low in aromatics (depending on the grade of the crude oil stream) and contains some cycloalkanes (naphthenes) and no olefins (alkenes). Between 0 and 20 percent of this stream is pooled into the finished gasoline, because the supply of this fraction is insufficient and its RON is too low. The chemical properties (namely RON and Reid vapor pressure) of the straight-run gasoline can be improved through reforming and isomerisation. However, before feeding those units, the naphtha needs to be split into light and heavy naphtha. Straight-run gasoline can be also used as a feedstock into steam-crackers to produce olefins. The density of gasoline generally ranges between 0.71 and 0.77 kg/L (719.7 kg/m3; 0.026 lb/in3; 6.073 lb/US gal; 7.29 lb/imp gal), with higher densities having a greater volume of aromatics. Finished marketable gasoline is traded with a standard reference of 0.755 kg/L, and its price is escalated or de-escalated according to its actual density. Because of its low density, gasoline floats on water, and so water cannot generally be used to extinguish a gasoline fire unless applied in a fine mist. The octane rating of typical commercially available gasoline varies by country. In Finland, Sweden and Norway, 95 RON is the standard for regular unleaded gasoline and 98 RON is also available as a more expensive option. In the United Kingdom, ordinary regular unleaded gasoline is sold at 95 RON (commonly available), premium unleaded gasoline is always 97 RON, and super-unleaded is usually 97–98 RON. However, both Shell and BP produce fuel at 102 RON for cars with high-performance engines, and in 2006 the supermarket chain Tesco began to sell super-unleaded gasoline rated at 99 RON. In the United States, octane ratings in unleaded fuels vary between 85 and 87 AKI (91–92 RON) for regular, 89–90 AKI (94–95 RON) for mid-grade (equivalent to European regular), up to 90–94 AKI (95–99 RON) for premium (European premium). Octane rating became important as the military sought higher output for aircraft engines in the late 1930s and the 1940s. A higher octane rating allows a higher compression ratio or supercharger boost, and thus higher temperatures and pressures, which translate to higher power output. Some scientists even predicted that a nation with a good supply of high-octane gasoline would have the advantage in air power. In 1943, the Rolls-Royce Merlin aero engine produced 1,320 horsepower (984 kW) using 100 RON fuel from a modest 27-liter displacement. By the time of Operation Overlord, both the RAF and USAAF were conducting some operations in Europe using 150 RON fuel (100/150 avgas), obtained by adding 2.5% aniline to 100-octane avgas. By this time the Rolls-Royce Merlin 66 was developing 2,000 hp using this fuel. LRP was marketed during and after the phaseout of leaded motor fuels in the United Kingdom, Australia, South Africa and some other countries. Consumer confusion led to a widespread mistaken preference for LRP rather than unleaded, and LRP was phased out 8 to 10 years after the introduction of unleaded. Methylcyclopentadienyl manganese tricarbonyl (MMT) is used in Canada and Australia to boost octane rating. It also helps old cars designed for leaded fuel run on unleaded fuel without the need for additives to prevent valve problems. Its use in the United States has been restricted by regulations. Its use in the European Union is restricted by Article 8a of the Fuel Quality Directive following its testing under the Protocol for the evaluation of effects of metallic fuel-additives on the emissions performance of vehicles. Gasoline, as delivered at the pump, also contains additives to reduce internal engine carbon buildups, improve combustion and allow easier starting in cold climates. High levels of detergent can be found in Top Tier Detergent Gasolines. The specification for Top Tier Detergent Gasolines was developed by four automakers: GM, Honda, Toyota and BMW. According to the bulletin, the minimal U.S. EPA requirement is not sufficient to keep engines clean. Typical detergents include alkylamines and alkyl phosphates at the level of 50–100 ppm. Though gasoline is a naturally colorless liquid, many gasolines are dyed in various colors to indicate their composition and acceptable uses. In Australia, the lowest grade of gasoline (RON 91) is dyed a light shade of red/orange and the medium grade (RON 95) is dyed yellow. In the United States, aviation gasoline (avgas) is dyed to identify its octane rating and to distinguish it from kerosene-based jet fuel, which is clear. In Canada, the gasoline for marine and farm use is dyed red and is not subject to sales tax. People can be exposed to gasoline in the workplace by swallowing it, breathing in vapors, skin contact, and eye contact. The National Institute for Occupational Safety and Health (NIOSH) has designated gasoline as a carcinogen. In the United States, most consumer goods bear pre-tax prices, but gasoline prices are posted with taxes included. Taxes are added by federal, state, and local governments. As of 2009, the federal tax is 18.4¢ per gallon for gasoline and 24.4¢ per gallon for diesel (excluding red diesel). 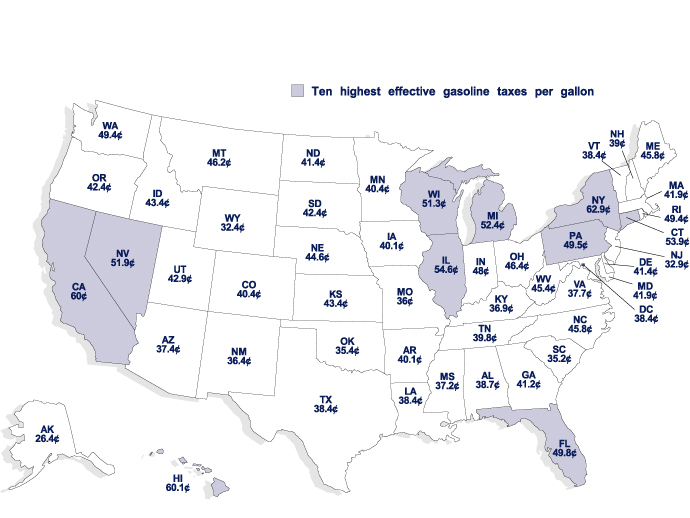 Among individual states, the highest gasoline tax rates, including the federal taxes as of 2005, are found in New York (62.9¢/gal), Hawaii (60.1¢/gal) and California (60¢/gal). EPA,OSWER, US. "Preventing and Detecting Underground Storage Tank (UST) Releases | US EPA". US EPA. Retrieved 2018-06-18. "Evaluation of the Carcinogenicity of Unleaded Gasoline". epa.gov. Archived from the original on 27 June 2010. Mehlman, MA (1990). "Dangerous properties of petroleum-refining products: carcinogenicity of motor fuels (gasoline)". Teratogenesis, carcinogenesis, and mutagenesis. 10 (5): 399–408. PMID 1981951. Baumbach, JI; Sielemann, S; Xie, Z; Schmidt, H (15 March 2003). "Detection of the gasoline components methyl tert-butyl ether, benzene, toluene, and m-xylene using ion mobility spectrometers with a radioactive and UV ionization source". Analytical Chemistry. 75 (6): 1483–90. doi:10.1021/ac020342i. PMID 12659213. See also: Stevens, Levi, "Improved apparatus for vaporizing and aerating volatile hydrocarbon," U.S. Patent no. 45,568 (issued: 20 December 1864). From p.2 of the text: "One of the products obtained from the distillation of petroleum is a colorless liquid having an ethereal odor and being the lightest in specific gravity of all known liquids. This material is known now in commerce by the term "gasoline." "
"The etymology of gasoline". Oxford English Dictionary. Archived from the original on 29 July 2017. Retrieved 30 July 2017. "Online Etymology Dictionary". etymonline.com. Archived from the original on 9 January 2006. Hincks, Ron (2004). "Our Motoring Heritage: gasoline & Oil". Chrysler Collector (154): 16–20. Kemp, John (18 March 2017). "India's thirst for gasoline helps spur global oil demand: Kemp". Reuters. Archived from the original on 30 August 2017. India's drivers used 500,000 barrels per day of motor spirit in the 12 months ending in February 2016, according to the Petroleum Planning and Analysis Cell of the Ministry of Petroleum. National Energy Advisory Committee (Australia). Motor Spirit: Vehicle Emissions, Octane Ratings and Lead Additives: Further Examination, March 1981. Australian Government Publishing Service. p. 11. ISBN 9780642066725. Archived from the original on 17 February 2017. Based on estimated provided by the oil refining industry, the Department of National Development and Energy has estimated that the decision to reduce the RON of premium motor spirit from 98 to 97 has resulted in an annual saving equivalent to about 1.6 million barrels of crude oil. "Premium Motor Spirit". Oando PLC. Archived from the original on 17 February 2017. Udonwa, N. E.; Uko, E. K.; Ikpeme, B. M.; Ibanga, I. A.; Okon, B. O. (2009). "Exposure of Petrol Station Attendants and Auto Mechanics to Premium Motor Sprit Fumes in Calabar, Nigeria". Journal of Environmental and Public Health. 2009: 1–5. doi:10.1155/2009/281876. PMC 2778824. PMID 19936128. "Nafta in English – Spanish to English Translation". SpanishDict. Archived from the original on 6 February 2010. Daniel Yergen, The Prize, The Epic Quest for Oil, Money & Power, Simon & Schuster, 1992, pp. 150–163. Matthew Van Winkle, Aviation Gasoline Manufacture, McGraw-Hill, 1944, pp. 1–4. Matthew Van Winkle, Aviation Gasoline Manufacture, McGraw-Hill, 1944, p. 10. Matthew Van Winkle, Aviation Gasoline Manufacture, McGraw-Hill, 1944, p. 3. Matthew Van Winkle, Aviation Gasoline Manufacture, McGraw-Hill, 1944, pp. 6–9. Matthew Van Winkle, Aviation Gasoline Manufacture, McGraw-Hill, 1944, p. 74. Matthew Van Winkle, Aviation Gasoline Manufacture, McGraw-Hill, 1944, p. 22. Matthew Van Winkle, Aviation Gasoline Manufacture, McGraw-Hill, 1944, p. 20. Matthew Van Winkle, Aviation Gasoline Manufacture, McGraw-Hill, 1944, p. 34. Matthew Van Winkle, Aviation Gasoline Manufacture, McGraw-Hill, 1944, pp. 12–19. Matthew Van Winkle, Aviation Gasoline Manufacture, McGraw-Hill, 1944, pp. 94–95. Robert W. Czeschin, The Last Wave; Oil, War, and Financial Upheaval in the 1990's, Agora Inc., 1988, pp. 13–14. Robert W. Czeschin, The Last Wave; Oil, War, and Financial Upheaval in the 1990's, Agora Inc., 1988, p. 17. Robert W. Czeschin, The Last Wave; Oil, War, and Financial Upheaval in the 1990's, Agora Inc., 1988, p. 19. "Gasoline—a petroleum product". U.S Energy Information Administration website. U.S Energy Information Administration. 12 August 2016. Archived from the original on 24 May 2017. Retrieved 15 May 2017. Bell Fuels. "Lead-Free gasoline Material Safety Data Sheet". NOAA. Archived from the original on 20 August 2002. Retrieved 6 July 2008. "Energy Information Administration". www.eia.gov. Archived from the original on 15 December 2015. "Fuel Properties Comparison" (PDF). Alternative Fuels Data Center. Archived (PDF) from the original on 31 October 2016. Retrieved 31 October 2016. "Oil Industry Statistics from Gibson Consulting". Archived from the original on 12 September 2008. Retrieved 31 July 2008. Ryan Lengerich Journal staff. "85-octane warning labels not posted at many gas stations". Rapid City Journal. Archived from the original on 15 June 2015. "95/93 – What is the Difference, Really?". Automobile Association of South Africa (AA). Archived from the original on 29 December 2016. Retrieved 26 January 2017. Hearst Magazines (April 1936). Popular Mechanics. Hearst Magazines. pp. 524–. ISSN 0032-4558. Archived from the original on 19 June 2013. "List of countries using leaded petrol in 2011". Archived from the original on 29 June 2014. "UN: Leaded fuel to be gone by 2013". Archived from the original on 5 March 2016. Matthews, Dylan (22 April 2013). "Lead abatement, alcohol taxes and 10 other ways to reduce the crime rate without annoying the NRA". Washington Post. Archived from the original on 12 May 2013. Retrieved 23 May 2013. Reyes, J. W. (2007). "The Impact of Childhood Lead Exposure on Crime". National Bureau of Economic Research. Archived 29 September 2007 at the Wayback Machine. "a" ref citing Pirkle, Brody, et. al (1994). Retrieved 17 August 2009. "Ban on leaded petrol 'has cut crime rates around the world'". 28 October 2007. Archived from the original on 29 August 2017. Seggie, Eleanor (5 August 2011). "More than 20% of SA cars still using lead-replacement petrol but only 1% need it". Engineering News. South Africa. Archived from the original on 13 October 2016. Retrieved 30 March 2017. Clark, Andrew (14 August 2002). "Petrol for older cars about to disappear". The Guardian. London. Archived from the original on 29 December 2016. Retrieved 30 March 2017. "AA warns over lead replacement fuel". The Daily Telegraph. London. 15 August 2002. Archived from the original on 21 April 2017. Retrieved 30 March 2017. Hollrah, Don P.; Burns, Allen M. "MMT INCREASES OCTANE WHILE REDUCING EMISSIONS". www.ogj.com. Archived from the original on 17 November 2016. "MEDIDA PROVISÓRIA nº 532, de 2011". senado.gov.br. Archived from the original on 19 September 2011. "Government to take a call on ethanol price soon". The Hindu. Chennai, India. 21 November 2011. Archived from the original on 5 May 2012. Retrieved 25 May 2012. "India to raise ethanol blending in gasoline to 10%". 22 November 2011. Archived from the original on 7 April 2014. Retrieved 25 May 2012. "Removal of Reformulated Gasoline Oxygen Content Requirement (national) and Revision of Commingling Prohibition to Address Non-0xygenated Reformulated Gasoline (national)". U.S. Environmental Protection Agency. 22 February 2006. Archived from the original on 20 September 2005. "Alternative Fueling Station Locator". U.S. Department of Energy. Archived from the original on 14 July 2008. Retrieved 14 July 2008. "How Gasoline Becomes CO2". Slate Magazine. 1 November 2006. Archived from the original on 20 August 2011. "How much carbon dioxide is produced by burning gasoline and diesel fuel?". U.S. Energy Information Administration (EIA). Archived from the original on 27 October 2013. This article incorporates text from this source, which is in the public domain. "CDC – NIOSH Pocket Guide to Chemical Hazards – Gasoline". www.cdc.gov. Archived from the original on 16 October 2015. Retrieved 3 November 2015. "Low IQ and Gasoline Huffing: The Perpetuation Cycle". Archived from the original on 14 August 2017. "Rising Trend: Sniffing Gasoline - Huffing & Inhalants". 16 May 2013. Archived from the original on 20 December 2016. "Petrol Sniffing / Gasoline Sniffing". Archived from the original on 21 December 2016. Lauwers, Bert (1 June 2011). "The Office of the Chief Coroner's Death Review of the Youth Suicides at the Pikangikum First Nation, 2006 – 2008". Office of the Chief Coroner of Ontario. Archived from the original on 30 September 2012. Retrieved 2 October 2011. "Labrador Innu kids sniffing gas again to fight boredom". CBC.ca. Archived from the original on 18 June 2012. Retrieved 18 June 2012. Wortley, R. P. (29 August 2006). "Anangu Pitjantjatjara Yankunytjatjara Land Rights (Regulated Substances) Amendment Bill". Legislative Council (South Australia). Hansard. Archived from the original (– Scholar search) on 29 September 2007. Retrieved 27 December 2006. Brady, Maggie (27 April 2006). "Community Affairs Reference Committee Reference: Petrol sniffing in remote Aboriginal communities" (PDF). Official Committee Hansard (Senate). Hansard: 11. Archived from the original (PDF) on 12 September 2006. Retrieved 20 March 2006. Williams, Jonas (March 2004). "Responding to petrol sniffing on the Anangu Pitjantjatjara Lands: A case study". Social Justice Report 2003. Human Rights and Equal Opportunity Commission. Archived from the original on 31 August 2007. Retrieved 27 December 2006. Submission to the Senate Community Affairs References Committee by BP Australia Pty Ltd Archived 14 June 2007 at the Wayback Machine. Parliament of Australia Web Site. Retrieved 8 June 2007. "EarthTrends: Energy and Resources—Transportation: Motor gasoline consumption Units: Million liters". Archived from the original on 27 September 2007. "U.S. Prime Supplier Sales Volumes of petroleum Products". United States Energy Information Administration. Archived from the original on 15 October 2007. Retrieved 24 October 2007. "Gas Prices: Frequently Asked Questions". fueleconomy.gov. Archived from the original on 21 January 2011. "When did the Federal Government begin collecting the gas tax?—Ask the Rambler — Highway History". FHWA. Archived from the original on 29 May 2010. Retrieved 17 October 2010. "New & Used Car Reviews & Ratings". Consumer Reports. Archived from the original on 23 February 2013. Biello, David. "Fact or Fiction? : Premium Gasoline Delivers Premium Benefits to Your Car". Scientific American. Archived from the original on 12 October 2012. "Why is summer fuel more expensive than winter fuel?". HowStuffWorks. Archived from the original on 30 May 2015. "Appendix B – Transportation Energy Data Book". ornl.gov. Archived from the original on 18 July 2011. Thomas, George: "Overview of Storage Development DOE Hydrogen Program" (PDF). Archived from the original (PDF) on 21 February 2007. (99.6 KB). Livermore, CA. Sandia National Laboratories. 2000. Eyidogan, Muharrem; Ozsezen, Ahmet Necati; Canakci, Mustafa; Turkcan, Ali (2010). "Impact of alcohol–gasoline fuel blends on the performance and combustion characteristics of an SI engine". Fuel. 89 (10): 2713. doi:10.1016/j.fuel.2010.01.032. "Extension Forestry - North Carolina Cooperative Extension" (PDF). Archived from the original (PDF) on 22 November 2012.